The system's BFO was developed following successful testing of the receiver's front-end and mixer circuitry. The BFO injects signals into both the receiver-section's product detector as well as the transmitter's balanced modulator. This photo shows the initial Manhattan wiring of the BFO board. The BFO's buffer uses the same shunt-feedback two-stage direct-coupled configuration used in the VFO buffer. Click to see the schematic of the BFO. 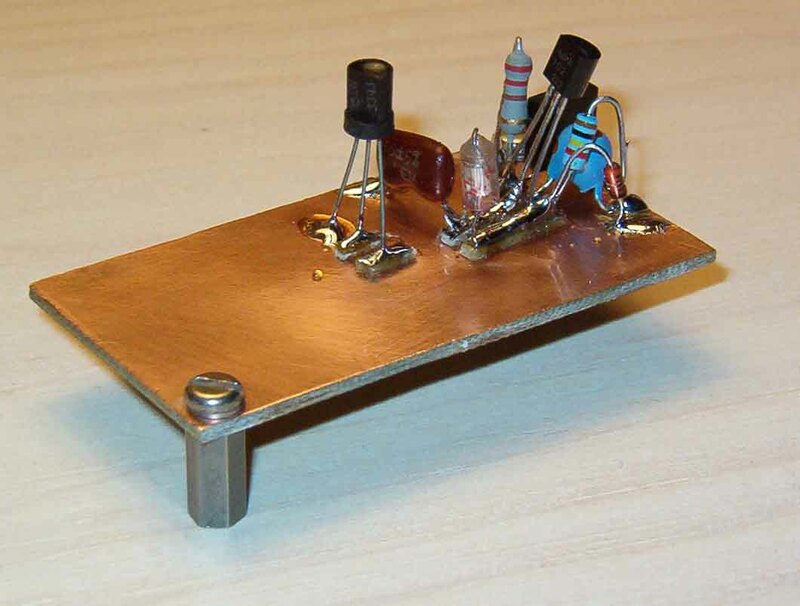 As the circuit for the BFO evolved, it was decided to perform a SPICE simulation to see how the oscillator might behave, prior to melting any solder. The simulation was attempted by capturing the schematic using National Instruments's Multi-Sim program v6.11 PowerPro for Windows. 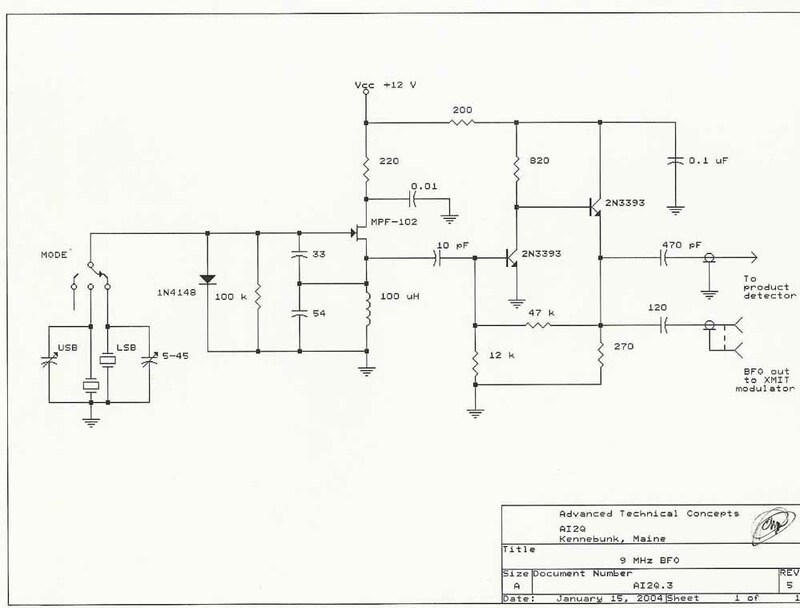 Click here to view the schematic for the BFO as captured in Multi-Sim. Interestingly, regardless of what Multi-Sim piezo crystal model was selected for the oscillator's crystal, none of the Multi-Sim simulations would "oscillate." Apparently, the simulated oscillator was too perfect; there were no imbalances to get oscillation started! In a real world oscillator, transistor and component noise, as well as power supply variations during initial power-up, are generally sufficient to get oscillation under way. It's akin to pushing a pendulum for the first time on a grandfather clock. 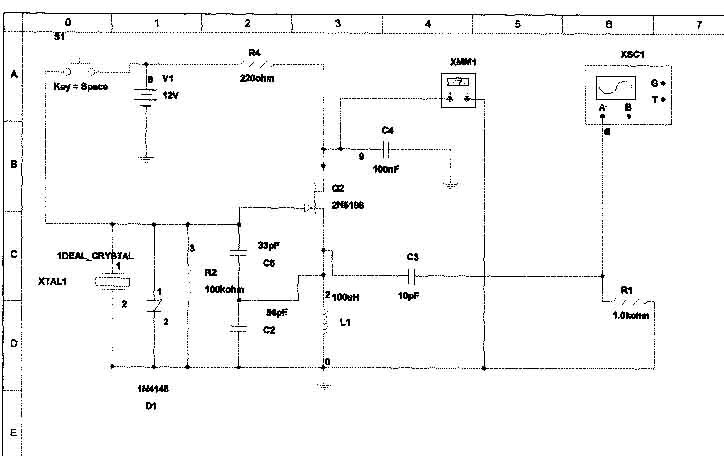 In this case, the power supply "spring" was wound, but the circuit needed a "pendulum push." After consulting with K8CN, Mike (a teacher who uses Multi-Sim in his classroom), it was decided to tack a crude virtual 12-V momentary switch to the crystal. You can see this pushbutton in the upper left-hand corner of the SPICE drawing. Lo and behold---one push of the spacebar "button" and the circuit broke into virtual oscillation. 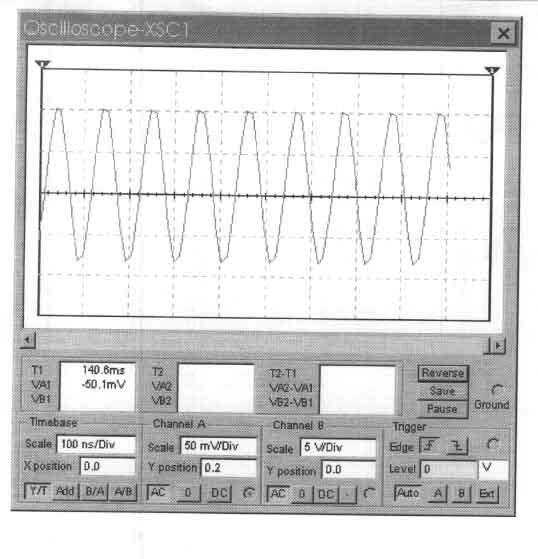 Depending on the CAE program's virtual oscilloscope settings, the initial start-up swings were even visible, and you could see the circuit settle into a steady oscillation state. Here's the image of the simulated oscillator's output waveform during normal operation. Click here for a short article in "Planet Analog" that I wrote about this adventure, as well as an additional interesting screen capture. Click to continue to see the BFO hardware. Use your Browser's BACK button to go back.